This is a really easy book to read – in fact, at 2am this morning, I had to force myself to stop reading! But I finished it as soon as I woke up. Lovely, rambling, big family story, with lots of interesting couples and non-couples. Ms. Thayer uses a brilliant device to draw in all the soon-to-be-family and give us a peek into their world one summer. The highs, the lows, the dreams, and the reality. It is messy, beautiful, poignant, passionate, and intense. But most of all, it is about love in all its forms and how it starts with loving oneself. David and Alison are the calm, rational, and clearly in love couple whose wedding plans bring their families together. Their unwavering, learned-over-time approach to life is such a perfect foil for the drama of the next generation. Alison segues into her new role in life with grace, determination, and plan for great family weekends with lots of food and laughter. David is straightforward, caring, and generous. I loved them! Lots of lovely vignettes of modern life and the way we wrap ourselves in habits and rules, and how something as simple as the ocean can clear the mind and bring back some magic. I will definitely be looking out for more of Ms. Thayer's stories to bring a smile to my face in the future. 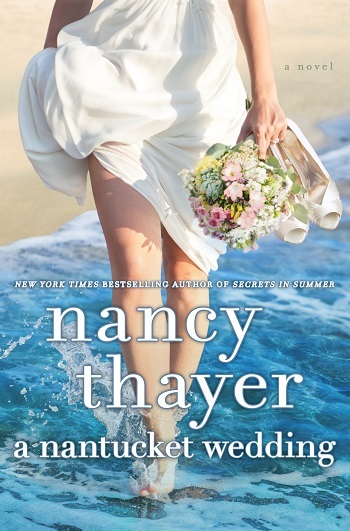 Reviewers on the Wicked Reads Review Team were provided a free copy of A Nantucket Wedding by Nancy Thayer to read and review.